You will get acquainted with wooden Karelian architecture and traditions of the Karelians, one of the indigenous peoples of the Republic. 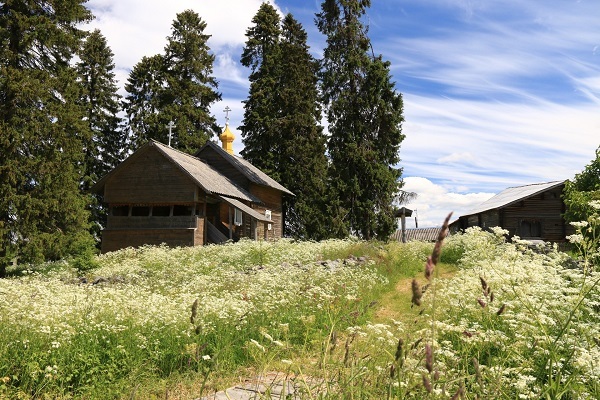 You will visit ancient wooden church dedicated to St. Peter, and Karelian village Kinerma, which was officially proclaimed the most beautiful Russian village. In the Kivach Nature Reserve you will enjoy the scenic view over Kivach Waterfall. 08:55 Arrival by train from Moscow. Meeting with the guide. Breakfast in the restaurant. 09:30 City tour of Petrozavodsk and afterwards transfer to the Kivach Nature Reserve. 12:30 Arrival in the Kivach Nature Reserve. During the excursion you will visit waterfall Kivach, which is the second plain waterfall in Europe, nature museum, and dendrarium, where you will get acquainted with typical local flora and fauna and with rare plants like Karelian birch. Afterwards picnic with shashlik and hot tea close to the nature reserve. 15:00 Transfer to the first Russian spa founded by Peter the Great. Upon arrival you will visit a cozy wooden church of the 18th century, which was beloved by Peter the Great. After the excursion you will taste mineral water from 3 springs of the first Russian spa. 17:00 Arrival in Petrozavodsk. Accommodation. Free time. 09:30 Meeting with the guide. Today we will get acquainted with the culture and traditions of Karelians, who are one of the indigenous peoples in Karelia. In the morning we head to Kinerma Village, which is an ancient Karelian village. In 2016 it was officially proclaimed the most beautiful village in Russia. 11:30 Meeting with Nadezhda, local resident of Kinerma Village. Thanks to Nadezhda the village became a unique monument of traditional wooden architecture. She did not only win several grants for the restoration of ancient houses, but also preserves the village in a traditional Karelian style. Excursion around the village and lunch with dishes of Karelian cuisine. 15:30 Arrival in Petrozavodsk. Visit of the Karelian Museum of Fine Arts. You will get acquainted with local icon painting and applied arts, learn more about Karelian traditions. Afterwards you will get acquainted with Karelian symbols of love, well-being and happiness. Using these symbols you will create your own pattern and decorate a blank shopping bag with Karelian print. This bag will be a nice unusual souvenir from Karelia. 17:00 Transfer to the railway station. 18:00 Departure for St. Petersburg by train. accommodation in the Severnaya Hotel (twin room), transfers by car for 2 pax/ by minibus from 4 pax, meals and excursions according to the program, English-speaking guide.